If music and science have something in common, it’s that they both require drive and passion. They are two very different careers paths, strewn with obstacles that are a challenge for those who decide to dedicate themselves to either one. And yet sometimes their paths cross and the scientist becomes at the same time a rocker, combining both passions. Coinciding with the International Day of Rock, celebrated on July 13, we take a look at the careers of five stars that have shone in laboratories and on the stage. Among the personalities who attended the funeral of Stephen Hawking was British rocker Brian May, the legendary guitarist of Queen. Unmistakable with his long white curly hair, May received his doctorate in astrophysics at Imperial College London in 2007. An admirer of Hawking, with whom he coincided several times in the Starmus festival, the rocker expressed on his Instagram account the pain he felt after the death of the scientist. “He was without a doubt one of the greatest intellects the world has ever seen,” he wrote. 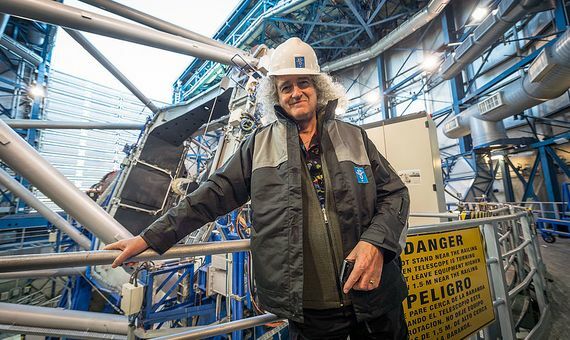 Brian May in one of the domes of the ESO Very Large Telescope. Credit: ESO/G. Huedepohl. His love story for science is that of a long courtship interrupted by Queen’s fame. It took him more than thirty years to get his doctorate. Interested in citizen science, in 2007 he promoted the Galaxy Zoo project, an initiative that invites Internet users to analyse and classify galaxies through images posted on the web. The co-founder and vocalist of the Californian band Bad Religion has been able to combine his academic career as a biologist with the recording of albums and touring with the group. In an interview in the magazine Nature, the American rocker Greg Graffin affirms that the group’s tours are governed by the academic calendar, taking advantage of the summer, which is when he has no fieldwork as a biologist. Graffin is a professor at the University of California (USA). “I struggled to keep one foot in music and one in academia,” he said in the interview. His passion for science and punk rock originated in his childhood. It was this challenge to the prevailing hypotheses and to authority that enticed him towards two very different disciplines. Holding a doctorate in zoology from Cornell University (USA), the lyrics of his songs reflect the influence of biology, such as “I Want Something More”, in which he describes how humans struggle to have their own vision of the world. In addition to teaching, research and music, Graffin has also written several popular science books. His goal is for new generations to think critically and creatively. Few particle physicists have four pop rock albums to their credit. From his adolescence, Brian Cox, born in Oldham, Lancashire, UK combined his studies with music. His beginnings were with the band Dare, which he left in 1992 to form part of the group D:Ream. 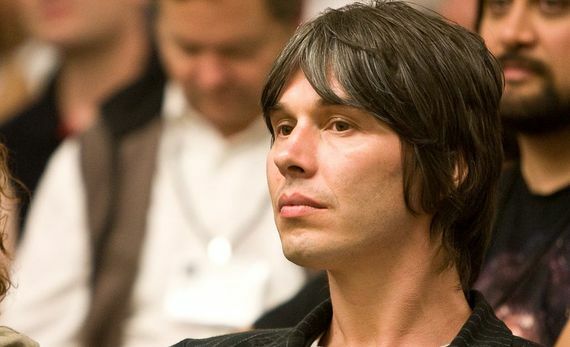 Brian Cox is a famous British physicist and popularizer with two pop rock bands. Credit: Bob Lee. The new band dissolved in 1997 and Cox took the opportunity to get his PhD in very high-energy particle physics the following year. From then on, his career has been divided between research—he worked on the Large Hadron Collider—and scientific dissemination, becoming a well-known presenter in the United Kingdom. When he had practically forgotten about his musical career, the singer of D:Ream proposed participating in a compilation album, In Memory Of… (2011), an offer which Cox could not refuse. “It was a great bit of my life and I just wanted to give it another go,” he told the BBC 6 music program. Considered one of the pioneer bands of pop punk, Descendents can also boast of having as vocalist and composer the American Milo Aukerman, doctor in biochemistry, who also carried out postdoctoral research in the department of biochemistry at the University of Wisconsin-Madison (USA). Contrary to what might be expected, music provided him with the stability that he did not find in his scientific career. Although he combined both professions for decades, he became increasingly disenchanted with scientific research, until one day he was laid off from the chemical company he worked at (he specialised in plant biotechnology) and decided to devote himself fully to music. As he explained in an interview with Spin magazine, punk rock was a way of escaping when his profession as a scientist was less and less creative. “The last several years have opened my eyes to how I could reinvent myself as a musician as opposed to a guy who has a career doing something else and does music as a hobby,” he told Spin. Today the band has stopped being his hobby and has become his way to earn a living. The life of Tom Scholz could have been that of the typical child who loves to design and assemble things. He was so good at it that he decided to pursue it and studied Mechanical Engineering at the prestigious Massachusetts Institute of Technology (MIT). He then worked at Polaroid as a design engineer. 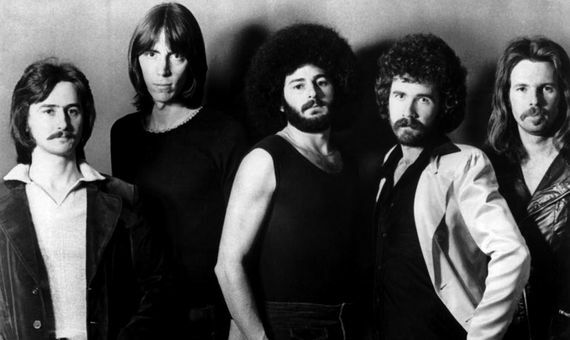 The second from the left is Tom Scholz, with the rest of the rock group Boston, in 1977. Credit: Premier Talent Associates. But the life of the American engineer would take an unexpected turn. His piano studies from childhood, together with his advances with the guitar, bass and drums, and the technical knowledge he acquired at Polaroid, encouraged him to set up a recording studio in the basement of his house, where he recorded the demo of the Rock group Boston. They sold more than 16 million copies of their first album released in 1976. His engineering blood never left him and he invented the Rockman guitar amplifier through his company Scholz Research & Development. In addition to being able to plug into headphones, the device offers various effects for the guitar.